Located in Marbella at Spanish wells, this beautiful 1st floor condo showcases a lovely southeastern exposure lake view. 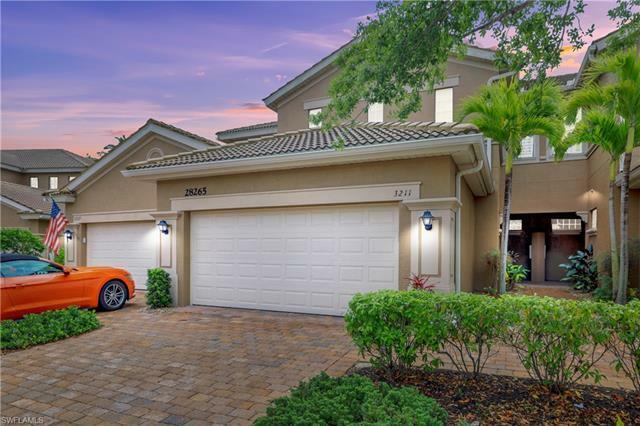 This is the Key Biscayne floor plan with 2-car garage and features the popular, great room plan which includes a kitchen open to living and dining area. All of the living areas are located on the ground floor. Other features include warm wood flooring and electric blinds in the main living area, newer kitchen appliances and on-trend coastal gray paint. The master suite is spacious with two closets, including a walk in, dual sinks plus a deep soaking tub and separate shower. The third bedroom has a built in Murphy bed and storage system. This condo it is nestled into a quiet, low traffic area of Marbella near a cul-de-sac. Marbella offers two pools for residents use. Spanish Wells Country Club offers a 27-hole golf course, restaurant and bar, 5-Har-Tru tennis courts, fitness room, bocce, and a variety of other activities. Membership is optional. Only 3.5 miles from Bonita Beach, with easy access to shopping, fine dining, I-75 and RSW. Floor plan available upon request.